If you are copying & pasting text from a web page or a document, it will copy the styles which won't match the styles on your template. Also it could cause formatting issues. To correct this is easy. 1. Click the text area. 2. Click "Clear Formatting" from the tools panel on the right side of the screen. 3. 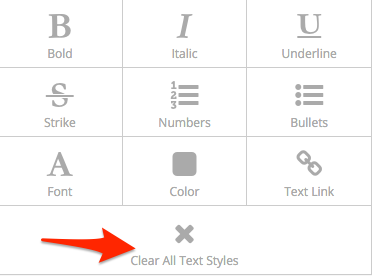 This will remove the pasted styles and revert to the text styles on the template.